Week One brings the excitement of a new season and the allure of unblemished records. Everyone hopes to get the PP6 season off to a good start. History tells us that good starts are common, which makes them that much more important. I looked at the statistics over the last five years (2012 -2016), comparing week one results to the season as a whole. On average, week one scores are 6.7 points higher than the season average. The group winning percentage has been 5.4% better than the season average. Maybe its coincidence that week one outperforms other weeks. Maybe its that the odds makers just need a week or two to figure the teams out. Maybe people spend more time researching the matchups in week one. Whatever the reason, in order to get off to a “good” start in week one, you’ll have to be a little better than normal. Refer to the table below for a summary of the results. ESPN made news last week for a decision they made concerning the broadcasting crew for Virginia’s opener against William & Mary. 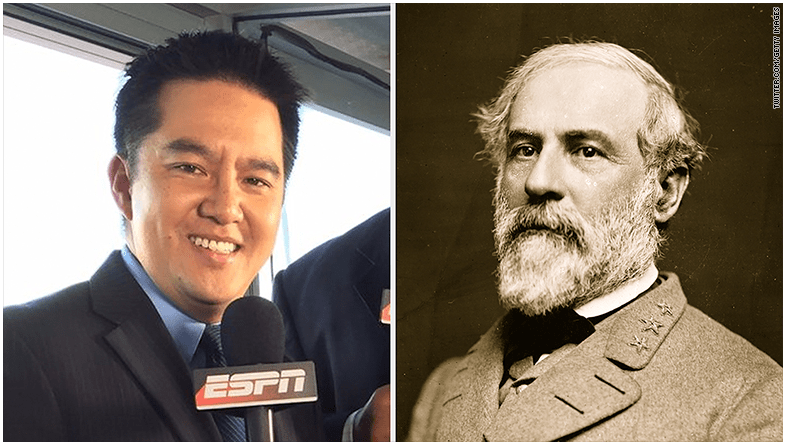 Robert Lee was supposed to be on the call. However, due to recent events in Charlottesville and the fact that he shares a name with the infamous Confederate general, Robert E. Lee, ESPN pulled him from the broadcast. He’ll be calling the Pitt vs Youngstown State game instead of the game at Virginia. Virginia’s opponent, William & Mary, is coincidentally the names of the only two people that were going to be watching that game an y way. It isn’t just a name that the two Robert’s share. They are also both human (as the side-by-side photo clearly demonstrates), they both put pants on one leg at a time and their favorite battle tactic is the extended flanking maneuver. I stumbled across a Baylor football gif earlier this summer, which reminded me of the greatest Baylor football gif of all-time. Both are attached below for your enjoyment. The one from this summer features a race between a Baylor staff member and a self-propelled tackling dummy. The staff member had two goals: Beat the dummy to the finish line, and don’t get embarrassed in the process. Mission…almost…accomplished. This is the famous collision from the 2015 Cotton Bowl. Somewhere in Cyberland, a community of squirrels are watching the gif in horrified empathy, while Taps plays gently in the background.